I cleaned up the exhaust on my Lazair last week. Removed the rust with an electrolytic rust removal bath and then a good scrub. Hopefully the BBQ paint will hold up for a few years. 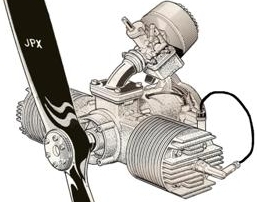 i've never set up a pair of Rotax's, but did you see George's bracket he installed on the side of his Rotax to attach the throttle cable below the carb? might be something quick and easy to do now in the garage rather than at the airfield with tape/gum/locwire/good intentions. lets see a pic of your machine too! Have you got a link to the other linkage? This plane was Glens until last summer and I don't want to change much before it flys. Should have alot more pictures in May when I get the plane out to the field.